An MIT assessment of solar energy technologies concludes that today’s widely used crystalline silicon technology is efficient and reliable and could feasibly be deployed at the large scale needed to mitigate climate change by midcentury. But novel photovoltaic (PV) technologies now being developed using specially designed nanomaterials may one day provide significant advantages. They could be easier and cheaper to manufacture; they could be made into ultra-thin, lightweight, flexible solar cells that would be easy to transport and install; and they could offer unique attributes such as transparency, opening up novel applications such as integration into windows or textiles. Since no single technology—established or emerging—offers benefits on all fronts, the researchers recommend rapidly scaling up current silicon-based systems while continuing to work on other technologies to increase efficiency, decrease materials use, and reduce manufacturing complexity and cost. One of the few renewable, low-carbon energy resources that could scale up to meet worldwide electricity demand is solar. Silicon solar cells do a good job transforming the sun’s energy into electricity today, but will they be up to the task in the future, when vast solar deployment will be needed to mitigate climate change? And what role might be played by the many other PV technologies now being developed in research labs the world over? Addressing such questions was the goal of a recent wide-ranging assessment by Vladimir Bulović, the Fariborz Maseeh (1990) Professor of Emerging Technology and MIT’s associate dean for innovation; Tonio Buonassisi, associate professor of mechanical engineering; Robert Jaffe, the Jane and Otto Morningstar Professor of Physics; and graduate students Joel Jean of electrical engineering and computer science and Patrick Brown of physics. The researchers’ first task was to examine their energy resource—sunlight. To no one’s surprise, the assessment confirmed that solar energy is abundantly available and quite evenly distributed across the globe. It varies by only about a factor of three across densely populated areas, and it isn’t highly correlated with economic wealth. In contrast, fossil fuels, uranium, and suitable sites for hydropower are heavily concentrated, creating potential tensions between the haves and have-nots. “Solar is a much more democratic resource,” notes Jean. And the world is beginning to take advantage of it. More than 1% of total global electricity is now provided by solar. Within the United States, solar deployment is growing at rates significantly exceeding projections made by experts just five years ago. 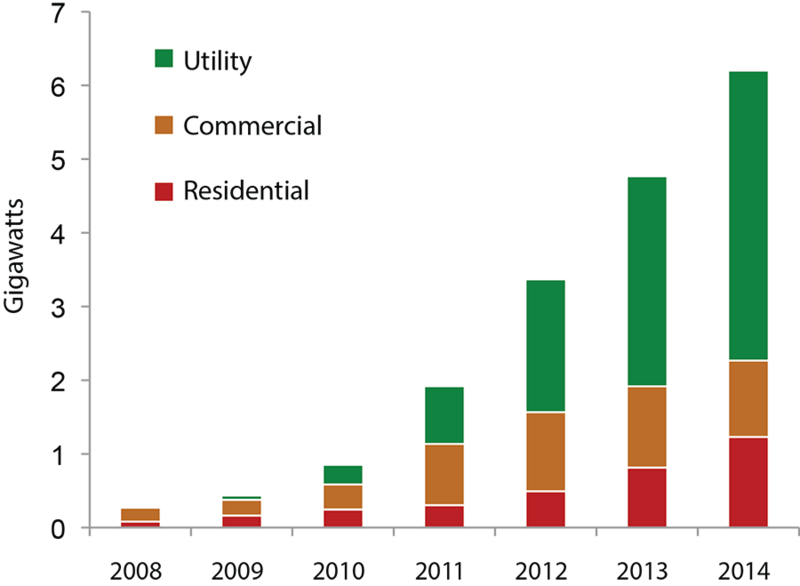 In 2014, solar accounted for fully a third of all new US generation capacity; and as shown in the figure below, residential, commercial, and (especially) utility-scale PV installations have all flourished in recent years. The world’s installed PV capacity exceeds 200 gigawatts (GW), accounting for more than 1% of global electricity generation. The chart above shows annual additions to PV capacity in the United States from 2008 to 2014. Additions to utility, commercial, and residential capacity grew substantially each year, with the greatest increase occurring in the utility arena. Between 2008 and 2014, total US grid-connected PV capacity grew from about 0.8 GW to 18.3 GW. To put those numbers into context, the solar generating capacity added in 2014 is equivalent to the total capacity of several large power plants. About 90% of current solar PV deployment is based on crystalline silicon solar cells—a technology that has been commercial for decades and is still improving. This efficient, reliable technology could achieve the needed large-scale deployment without major technological advances, says Bulović. But it’s tough to make it cheaper. In the solar PV business, costs are divided into two categories: the cost of the solar module—the panel consisting of multiple solar cells, wiring, glass, encapsulation materials, and frame—and the “balance of system” (BOS), which includes hardware such as inverters and wiring plus installation labor, permitting, grid interconnection, inspections, financing, and the like. Since 2008, the cost of the module has dropped by 85%, but the BOS cost hasn’t changed much at all. Today, the solar module is responsible for just one-fifth of the total cost of a residential installation and one-third of the cost of a utility-scale installation in the United States. The rest is the cost of the BOS. Reducing BOS costs isn’t easy with silicon. Silicon isn’t very good at absorbing sunlight, so a thick, brittle layer is needed to do the job, and keeping it from cracking requires mounting it on a heavy piece of glass. A silicon PV module is therefore rigid and heavy—features that raise the BOS cost. “What we need is a cell that performs just as well but is thinner, flexible, lightweight, and easier to transport and install,” says Bulović. 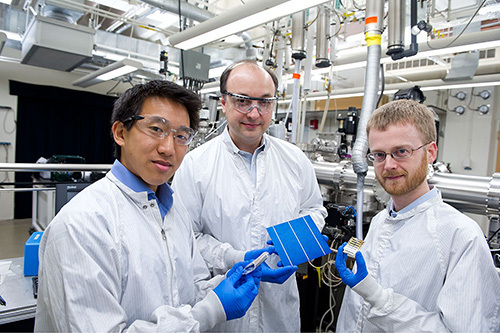 Research teams worldwide are now on the track of making such a PV cell. They’re starting not with silicon—a structurally simple material—but rather with a variety of more complicated nanomaterials that can be specially designed to capture solar energy and convert it into electricity. Evaluating the many PV technologies now in use and under development is difficult because they’re all so different. At the most basic level, they employ different active materials to absorb light and collect electric charge. In general, they fall into three broad categories. Wafer-based cells include traditional crystalline silicon and alternatives such as gallium arsenide; commercial thin-film cells include amorphous (non-crystalline) silicon, cadmium telluride, and copper indium gallium (di)selenide (CIGS); and emerging thin-film technologies include perovskite, organic, and quantum dot (QD) solar cells. Comparing the strengths and weaknesses of those and other options requires a way to organize them. The conventional classification system—established in 2001—groups solar technologies into three “generations” based on efficiency and cost. But that scheme “may not adequately describe the modern PV technology landscape,” says Bulović, because many of the technologies—both old and new—don’t fit well into their assigned categories. In addition, such a chronological scheme treats older technologies pejoratively. “Third generation” will always sound better than “first generation.” But silicon—a first-generation technology—still offers many advantages and commands the vast majority of the solar cell market. 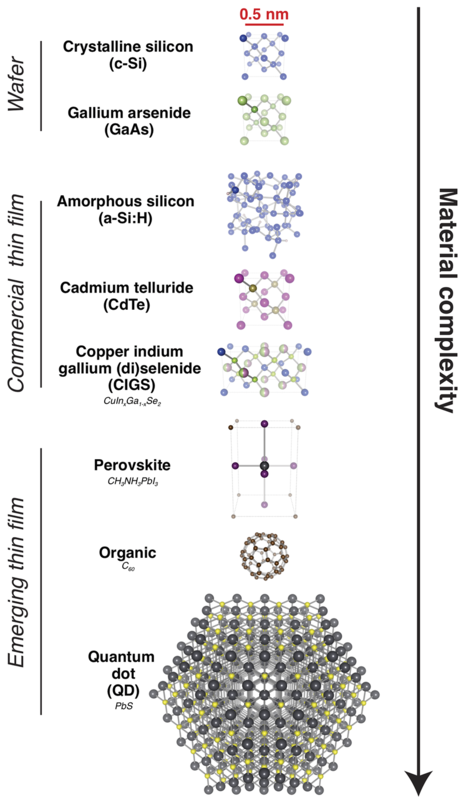 This figure shows the researchers’ proposed scheme for classifying PV technologies based on material complexity, defined roughly as the number of atoms in a molecule or repeating crystal unit. These “building blocks” are highlighted above to show their relative complexity. The wafer-based technologies near the top consist of single- or few-atom building blocks. The thin-film technologies are then arranged in order of increasing complexity, ranging from amorphous elemental materials such as amorphous silicon, through polycrystalline thin films such as cadmium telluride, to complex nanomaterials such as quantum dots, which contain thousands of lead and sulfur atoms. One such measure is manufacturing complexity and cost. While silicon is structurally simple, turning it into wafers and solar cells is complicated and expensive, in part because of the need for stringent purity (>99.9999%) and high temperatures (>1400°C). Processing more complicated-looking nanomaterials is generally easier, cheaper, and less energy-intensive. For example, preliminary chemical reactions at moderate temperatures can be used to transform starting materials into organic molecules or QDs. Those complicated building blocks can then be deposited at low temperatures through vapor or solution processing, which could make them compatible with a variety of substrates as well as with high-speed production processes such as roll-to-roll printing. Another critical measure of PV technology is power conversion efficiency, defined as the fraction of the incoming solar energy that comes out as electrical energy. Crystalline silicon is still the technology to beat, with record cell efficiencies of up to 26%. Emerging nanomaterial-based technologies are currently in the 10%–20% range. However, because complex nanomaterials can be engineered for maximum light absorption, they can absorb the same amount of light as silicon with orders of magnitude less material. “So while the typical silicon solar cell is more than 100 microns thick, the typical nanostructured solar cell—one that uses QDs or perovskites—can be less than 1 micron thick,” says Bulović. And that active layer can be deposited on flexible substrates such as plastic and paper with no need for mechanical support from a heavy piece of glass. 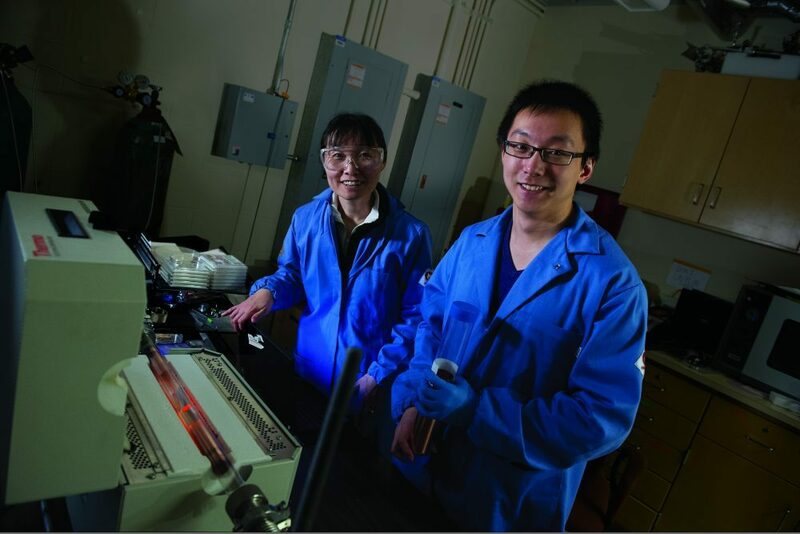 Thus far, the high efficiencies promised by such novel thin-film PV technologies have been achieved only in laboratory samples smaller than a fingernail, and long-term stability remains an issue. But with additional work, technologies based on complex materials could offer a range of valuable attributes. Such technologies could be made into lightweight, flexible, robust solar modules, which could bring down BOS costs in systems connected to the power grid. They could be used to power portable electronic devices ranging from mobile phones to small water purification systems; they could be transported and installed in remote areas; and they could be well-suited to the low-power lighting and communication requirements of the developing world. Finally, they could have unusual properties that permit novel applications. For example, some nanomaterials can be engineered to absorb ultraviolet and infrared light while letting through visible light, so they could be integrated into, say, windows, skylights, and building facades. The prospect of scaling up today’s solar generation—perhaps by a factor of 100—raises another issue: materials availability. Will the large-scale deployment of solar power be limited by the availability of critical materials needed to manufacture solar cells? How do the different technologies perform on this measure? To find out, the researchers determined the materials requirements for each PV technology. They then calculated how much of those materials would be needed if that technology were used to satisfy 5%, 50%, or 100% of global electricity demand in 2050. (Using the International Energy Agency’s estimates of demand in 2050, those fractions translate to installed PV capacities of 1,250, 12,500, and 25,000 gigawatts [GW] of power—all of which dwarf today’s installed PV capacity of roughly 200 GW.) Finally, they checked current global production of each material and determined how many additional hours, days, or years of production at current levels would be needed to meet the selected deployment targets with the various technologies. The figure below summarizes their findings. Meeting 100% of 2050 global electricity demand with crystalline silicon solar cells would require the equivalent of just six years of current silicon production. Such a scale-up of production by 2050 is certainly feasible, so materials constraints are not a major issue for silicon. The availability of critical materials could constrain a major scale-up of solar capacity using certain PV technologies. This figure shows how much additional time would be needed at current production rates to supply key materials to meet three levels of 2050 electricity demand—5%, 50%, and 100%—using selected PV technologies. Materials availability doesn’t limit the expanded use of today’s silicon-based cells or emerging PV technologies. In contrast, using commercial thin-film technologies such as cadmium telluride to supply the bulk of projected electricity demand would require hundreds of years of producing key materials at current rates. The needed growth in annual production of those materials between now and 2050 would be well beyond the realm of historical precedent. 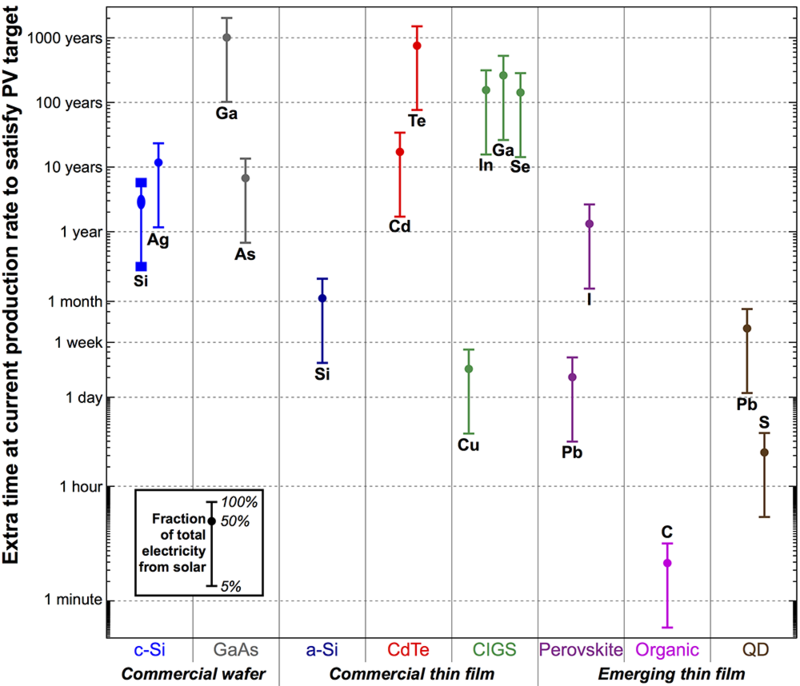 In contrast, the emerging thin-film technologies use abundant primary metals that are produced in high volume. For example, meeting 100% of demand with QD-based solar cells would require the equivalent of only 22 days of global lead production and six hours of global sulfur production. Perovskites would require at most three years of current production of their constituent elements. The researchers conclude that work should continue on all the technologies, with efforts focused on increasing conversion efficiency, decreasing materials use, and reducing manufacturing complexity and cost. Right now, no single technology promises to be best on all three measures, and predicting how each will evolve over time is difficult. For example, if emerging technologies start being used in mobile phone displays or windows or curtains, meeting that demand could help manufacturers work through production issues, perhaps enabling lower-cost, larger-scale production in the future. J. Jean, P.R. Brown, R.L. Jaffe, T. Buonassisi, and V. Bulović. “Pathways for solar photovoltaics.” Energy & Environmental Science, vol. 8, pp. 1200–1219, 2015. MIT Energy Initiative. The Future of Solar Energy: An Interdisciplinary MIT Study. Chapter 2: “Photovoltaic Technology,” pp. 21–45, 2015.